Head of Donetsk military and civilian administration Pavlo Zhebrivsky has given details about a recent attack by Russia's hybrid military forces on the Ukrainian-controlled town of Krasnohorivka in Donetsk region on Sunday, May 28. "Russian occupiers have again mounted attacks on Krasnohorivka. Firing from Grad systems, tanks, mortars. There are direct hits on buildings," he wrote on Facebook on Sunday morning. 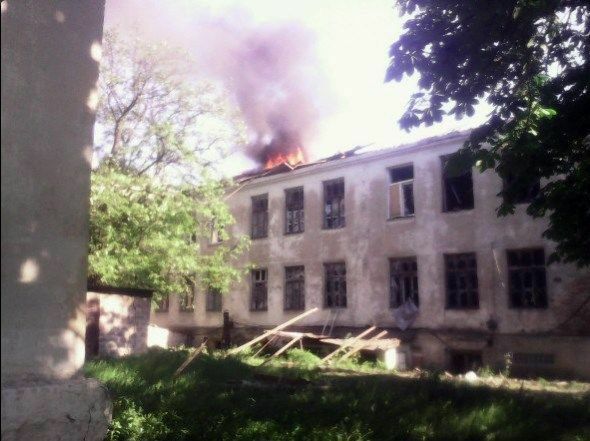 "Explosions have damaged the buildings of secondary school No. 2, the hospital. The school's second floor has caught fire," he added. Zhebrivsky later posted an update, saying that rescuers had extinguished the fire. According to verified reports, two females and one male have been injured as a result of the attack, he wrote. As UNIAN reported earlier, Russian proxies started shelling Krasnohorivka's residential areas at 06.40 on May 28. The attack lasted for two hours.